Steindorff® Stereo Zoom Advanced Microscopes represent the latest in zoom technology. They are ideal for studying all aspects of biology including living organisms, dissections, in addition to geology, small parts and industrial inspection. The binocular head is inclined at a 45° angle for ease of operation and comfort. A heavy duty slip clutch system assures long life of the rack & pinion system. Dual diopter controls are standard on both viewing tubes. The interpupilary distance range is from 55mm to 75mm. The three way built in illumination system allows transmitted, incident or dual lighting. Top light is 12v 20w halogen with variable intensity control and the bottom is cool white fluorescent 110v 5w, that allows for extended examination of live specimens. 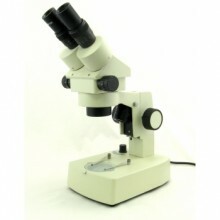 The microscope comes in a fitted styrofoam box with instruction manual dust cover and a five year warranty. As with all our microscopes sold the internet, an additional one year extended warranty is included at no charge bringing the warranty total to six years. Click the button below to add the Steindorff® Advanced Binocular Stereo Zoom Microscope - 7x - 45x Magnification to your wish list.